Secondary and Tertiary Structures of Hyaluronan in Aqueous Solution. Some Biological Consequences. Born 1930 in Macclesfield, England. Dr. Scott was educated at Macclesfield King's School, where he became enamored of cricket, chess and music, and at Manchester University (1948-1956) where Nobel Laureates Blackett and Lewis were in post and the first stored program computer ran. His Ph.D. (A. V. Hill prize) included the discovery of critical electrolyte concentration phenomena, - the basis of the manufacture of the world's heparin for decades. Commissioned in the Royal Air Force (1956-1958). He developed interests in ultrastructure/function relationships in the Medical Research Council's Rheumatology Unit in Taplow (1960-76) winning the British Biochemical Society's gold medal (1973). Returned to Manchester (1976) as Professor in Chemical Morphology, the first Chair in the field. The discovery of secondary and tertiary structures in extracellular matrix glycosaminoglycans, the development of electron histochemical methods for proteoglycans in tissues and the discovery of shape modules which organize connective tissue matrices, followed. Other interests include prebiotic evolution. Achievements include: Robert Feulgen Prize (1986) from the European Society of Histochemistry; Wenner-Gren Distinguished Lectureship, Stockholm (1995); Honorary Memberships of 3 learned societies; 4 visiting Professorships (USA and Australia); Honorary Fellow of Massey University, New Zealand; editorships of 9 Journals and Emeritus Professor of Manchester University. Published 250 papers, chapters, patents and two books. Hyaluronan is simple, as biopolymers go. Hyaluronan molecules are straight chains containing hundreds or thousands of sugar units, which are of only two kinds: N-acetylglucosamine and glucuronate (Fig. 1), in alternation as disaccharides. Only one kind of hyaluronan exists. It is the archetypal glycosaminoglycan. Similar anionic glycosaminoglycans include the chondroitin, keratan and heparan sulfates which, by contrast, can exist in astronomical numbers of possible isomers, because their sulfate groups can be distributed along the polymer in many different ways. Since each glucuronate unit carries an anionic charge at physiological pH, associated with its carboxylate group, there are often hundreds of negative charges fixed to each chain. These charges are balanced by mobile cations such as Na+, K+, Ca++ and Mg++. An hyaluronan molecule is a little chunk of soluble cation exchanger. The charges are important in determining solubility in water, since hyaluronan, converted into an uncharged polymer by fully esterifying with methyl, is insoluble. Nevertheless, the hyaluronan story is not simple. Sometimes its role is mechanical or structural; grossly obvious, as in the synovial fluid, the vitreous humor, or Wharton's Jelly in the umbilical cord. On the other hand, it interacts at vanishingly small concentrations with some cells, showing very high specificity and triggering off important responses. Many cells carry receptors for hyaluronan. Hyaluronan is an ancient molecule, evolutionarily speaking, and there has been ample time to develop new tricks as the biosphere increased in complexity. The key lies in the shapes that hyaluronan can take up. For decades the classical methods of polymer chemistry (viscosity, light scattering, ultracentrifugation), applied by fine scientists, supported the idea that hyaluronan chains in solution were random coils. However, these techniques measure bulk properties, the averaged-out contributions of large numbers of molecules, which must be interpreted by reference to theoretical models. Compatibility with such models does not necessarily prove the postulates underlying the models. There is a point to be made here, of great significance in the molecular understanding of biological phenomena. That is, the more random a system, the less information there is in that system. The achievements of living material were gained by reducing entropy, increasing information and making use of permanent and reproducible shapes. Moreover, when species interact specifically and avidly with each other, much of the entropy of a random system is lost. Thus, interactions in a random system would be weaker and less specific. Therefore, attempts were made to see if hyaluronan has preferred shapes1 . Hyaluronan chains contain two kinds of links. One kind, the sugar rings, are relatively fixed in their shapes. Between these rigid units are the glycosidic links, which consist of single oxygen atoms joining one sugar to the next. These oxygen atoms contribute two bonds that are directed like the arms of the letter V. Substituents attached at the ends of these arms can rotate through 360 degrees. Although computation and molecular modeling showed some time ago that there is not total freedom to take up all possible configurations about the O atoms in glycosidic bridges, since sugars may get in the way of each other, yet there are several possible configurations at each bridge. Multiply this choice by the number of bridges in a long chain, and the result is an enormous number of shapes per molecule. It is not random, but it looks a bit like it. The first indication that hyaluronan did have preferred shapes came from chemical experiments, which showed that parts of the hyaluronan structure (the glycol group in the glucuronate residue, Fig. 1) were resistant to periodate oxidation, although identical structures in similar polymers and environments were easily attacked. Molecular models based on a combination of periodate data with low resolution X-ray fiber results suggested that an extensive hydrogen-bonded structure was present in hyaluronan1. Nuclear magnetic resonance confirmed the presence of this ordered structure in solution (Fig. 1), in which each disaccharide unit is twisted through 180 degrees compared with those ahead and behind it in the chain. Two twists (totalling 360 degrees) bring back the original orientation; hence this structure is a two-fold helix (not a double helix, in which two molecular chains are involved). Refined computer simulations suggested that water played an important part in stabilizing the structure2. A tetrasaccharide from a hyaluronan chain, consisting of two disaccharide repeating units showing the preferred configuration in water. G = glucuronate, N = N-acetylglucosamine. This tapelike structure shows gentle curves both in plan and elevation projections (Fig. 2), and these are important in determining how hyaluronan molecules can form duplexes with each other. Interestingly, the chondroitin, keratan and dermatan sulfates also prefer to take up a similar two-fold helix in water. Although a double helix was observed in X-ray studies of hyaluronan by Struther Arnott's group, it was only present in solid preparations made at pHs lower than would be reached in normal physiological environments. Other multifold single chain helices were seen at higher pH, dependent on the bound cation. It is probably true to conclude that these X-ray studies demonstrated possibilities open to the polymer chain, rather than what is preferred in aqueous solution under physiological conditions. Plan (1) and elevation (2) of computer drawn projections of the tapelike hyaluronan molecule. (3) is the view seen along the two fold helix axis. Note the polymer chain follows a gentle curve in both (1) and (2), in planes at right angles to each other. The N atoms are shown as blue circles. Modified from Atkins, EDT, Meader, D and Scott, JE (1980) cited in Ref. 1. The significance of this secondary structure (as distinct from the simple sequence of sugars which is the primary structure) became clearer when it was noticed that hyaluronan in the two-fold helix had an extensive hydrophobic patch1, of about 8 CH units, roughly the same size as octanoic acid (Fig. 3). The chondroitin, keratan and dermatan sulfates have similar hydrophobic patches in much the same position in their two-fold helices. Thus, hyaluronan has the properties of a highly hydrophilic (polyhydroxylic) material simultaneously with hydrophobic patches characteristic of lipids, i.e. it is amphiphilic. Hydrophobic patches can have far-reaching implications for molecules in a watery environment. Hydrophobic molecules clump together in water, thus reducing their interface with the solvent. This mechanism drives the formation of membranes and contributes to the stability of e.g. the double helix in DNA. It is called hydrophobic bonding, although no chemical bond is formed. Model of a hyaluronan oligosaccharide constructed from space filling Courtauld atoms, based on the structure in Fig. 1. The H-bonds arrowed are between the acetamido and neighboring glucuronate units. The H atoms marked with a cross are part of a hydrophobic patch consisting of 8 CH groups. The hydroxymethyl group can be rotated easily to add its CH2 to this patch. See Scott,1989 (Ref. 1). The hydrophobic patch accounts for very interesting properties of hyaluronan. Peter Ghosh in Sydney, Australia and Yvonne Pasquali-Ronchetti in Modena, Italy, using NMR and rotary-shadowing electron microscopy, respectively, found that phospholipids (important components of membranes) formed complexes with hyaluronan. Peter Ghosh suggested that the lipidic inflammatory mediator, platelet activating factor, could bind similarly and that by sequestering this and other noxious substances hyaluronan might exert a beneficial action in inflamed joints. Relationships of hyaluronan with lipid membranes start very early, since hyaluronan is biosynthesized in the outer cell membranes. J. A. Sirs at St. Mary's Hospital, London demonstrated that hyaluronan increased the flexibility of red cell membranes. It may be relevant that R. Reed and coworkers in Bergen, Norway showed that hyaluronan increases in lymph flow during absorption of fats from the small intestine. Perhaps many of the biological roles of hyaluronan always depended on its ability to work with membranes. Hyaluronan has features that Peter Mitchell speculated would be found in 'transporter' molecules, which move compounds of all kinds across cell membranes. These transporters should have hydrophobic and hydrophilic properties that can be switched in crossing the membrane, carrying something in or out of a cell. Hyaluronan also aggregates with itself, partly helped by bonding between the hydrophobic patches3. The flat and tape-like secondary structure (Fig. 2) has fascinating properties; both sides are identical, but one side of the tape runs in the opposite sense to the obverse side; i.e. they are antiparallel. As a consequence of this, what is possible on one side of the tape is also possible on the other. Aggregates can grow from both sides. I coined the term "ambidexteran" to describe such polymers, from ambidextrous; "able to use both hands equally well". Electrostatic repulsion between the many negative charges, which would promote dissociation of the aggregates, is countered not only by hydrophobic interactions but also by H-bonding between acetamido and carboxylate groups (Fig. 4). These very short range interactions demand close complementarity between the two participants, and this is best obtained when the hyaluronan interactants are antiparallel to each other (Fig. 4). Only then do the gentle curves in their shapes (Fig. 2) mutually complement each other, and hydrophobic and H-bonding are then optimal. E.D.T. Atkins in Bristol, U.K. observed a H-bond between acetamido and carboxylate groups on neighboring hyaluronan molecules in X-ray fiber studies. A and B are elevation and plan projections respectively of a hyaluronan molecule. The red patches in B are the hydrophobic patches stretching along three sugar units on alternate sides of the polymer chain. Circles represent acetamido and squares represent carboxylate groups. Only the most relevant atoms are shown in A and B. See Fig. 2 for complete structures. C is a scheme, seen in side view, of a possible duplex between two molecules of hyaluronan (similar structures are possible for chondroitin, keratan and dermatan sulfates and mixtures of two or more, including hyaluronan, see also Fig. 5). The two participating molecules are antiparallel to each other. The dotted lines delineate each sugar unit. 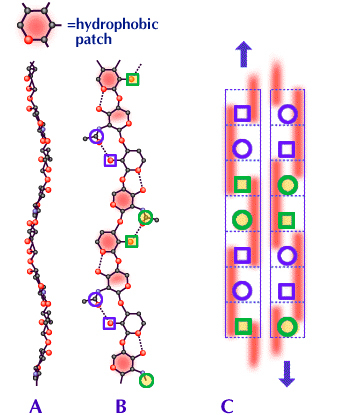 The red bars are the hydrophobic patches stretching along three sugar units, alternating between front and back of the polymer chain. The blue circles and squares are on the same edge of the molecule and of the duplex (see also B). The curves in each molecule, seen in A and B, closely follow the same course in the antiparallel arrangement so that the two molecules fit well together in the duplex. The hydrophobic patches then engage closely with each other and the acetamido and carboxylate groups are within H-bonding distances. Rotary shadowing-electron microscopy showed that honeycomb-like meshworks were formed at very low hyaluronan concentrations (1 microgram/ml). High molecular mass hyaluronan meshworks at this concentration showed no molecular ends or tails. The meshworks were essentially infinite. Every hyaluronan molecule was connected with all the rest, via the meshwork. On the contrary, although lower molecular mass hyaluronan formed meshworks at low concentrations, these meshworks were islands, separated from each other2. The interactions which hold meshworks together are fairly weak, so that aggregates form and dissociate, depending on conditions and temperatures. As the hyaluronan concentration increases, the meshwork contains thicker branches, until at concentrations seen, for example, in synovial fluids (>1 mg/ml) sheets and tubes of striking morphology are observed by rotary shadowing electron microscopy. The important point is that these meshworks are ordered. The shapes of the hyaluronan secondary structures determine the shapes of the aggregates, and each branch in the meshwork of ambidexterans carries with it two clear intrinsic directions, up or down, established by the hyaluronan chains. This may have organizational consequences, for instance, in guiding morphogenesis. Chang, Boackle and Armand4 discovered that hyaluronan was a potent inhibitor of complement activated lysis of red blood cells, but only in a 'denatured' form. Hyaluronan solutions prepared and maintained at ambient temperatures were almost devoid of this activity, but by heating to 100 degrees C and then snap freezing to capture the 'denatured' form, the solution acquired inhibitory power. If it was cooled slowly the hyaluronan had time to 'renature' and the product was a poor inhibitor. Thus, hidden or locked-up biological properties of hyaluronan in solutions at moderate concentrations may be liberated by processes which break up hyaluronan aggregates. The ordered-meshwork potential of hyaluronan is also of functional significance, particularly well exemplified in the vitreous humor of the eye. The space occupied by the vitreous between the lens and the retina should be optically empty, and free of cells, suspended matter and blood vessels that block or scatter light. Many details of how this is achieved are not known, but the outline is clear. The vitreous is a stable gel, which in humans (and many animals) contains hyaluronan. Even high molecular mass hyaluronan does not form a gel at concentrations found in the vitreous (~2 mg/ml), and rigidity in this tissue is increased by the incorporation of a very sparse meshwork of thin collagen fibrils. The vitreous is a fiber-reinforced composite material, with the amounts of the non-aqueous components reduced to a minimum compatible with mechanical stability, thereby introducing as little solid material as possible into the light path (vitreous is ~99% water). There was no idea of how hyaluronan and collagen in the vitreous are organized at the molecular level until new electron histochemical techniques revealed two levels of organization5. The thin (10 nm) collagen fibrils are held apart in bunches or sprays by bridges and ties of anionic glycosaminoglycans, probably chondroitin sulfate (Fig. 5). These bunches run in parallel and sometimes at right angles to each other. Why don't these sprays or bundles entangle and aggregate over years of environmental stresses? This seems to be a function of hyaluronan. Hyaluronan interacts with anionic glycosaminoglycans such as chondroitin sulfate in much the same way as it interacts with itself, as shown by computer modelling and experiments in vitro. This interaction may occur in the vitreous, serving to hold the chondroitin sulfate bridges apart, maintaining the very sparse meshwork of dissolved hyaluronan, chondroitin sulfate and collagen fibrils in a stable jelly (Fig. 5). Support for this model came from the experiments of Richard Mayne in Birmingham, Alabama. When the hyaluronan of vitreous humor was digested with a specific hyaluronidase, the collagen fibrils indeed aggregated to form a visible coagulum. Collagen fibrils aggregate 'naturally' in aging vitreous, giving rise to 'floaters', especially disturbing in persons with myopia, and affecting large numbers of elderly people. At the same time, the vitreous partly liquefies, particularly in the central regions. The hyaluronan is partly degraded, possibly by a free-radical mechanism driven by constant exposure to visible radiation. There are clear similarities between the age-related processes and the enzymic degradation of vitreous hyaluronan in Richard Mayne's experiments. Minor chemical breakdown disproportionately affects the infinite meshwork structure. Electron microscopy showed that continuous meshworks broke up into island meshworks2 subsequent to minor degradation by free-radicals, even though the 'damaged' hyaluronan molecules were still of considerable size. The molecular strands of hyaluronan were then not long enough to reach hyaluronan molecules in neighboring aggregates, at low concentrations of hyaluronan. D. J. Rees group in Bedford, U.K. found that the presence of small molecular mass hyaluronan degraded the elastic and viscous behavior of high molecular mass hyaluronan solutions. Probably low molecular mass hyaluronan competed at branch points of the meshwork, displacing high molecular mass hyaluronan so that the meshwork fell apart at that point. Thus, breakdown of hyaluronan may damage the meshwork in two ways. Cells with hyaluronan receptors and/or binding sites can anchor extensive meshworks (halos) of hyaluronan around themselves. These halos may prevent other cells, particles and large molecules from approaching closely (an excluded volume effect) to the cell, as demonstrated by Bob Fraser in Melbourne, Australia. If the particles are noxious or capable of producing damaging chemicals, the halos are protective. However, a halo consisting of low molecular mass hyaluronan was not highly efficient, and cell damage caused by an enzyme that generated OH free-radicals was much greater, compared with cells protected by higher molecular mass hyaluronan, as shown by Donatella Presti and J. E. Scott6 (Fig. 7). Fig. 7　Cell anchored hyaluronan meshworks can prevent cells, particles and large molecules from approaching closely to the cell membrane. High molecular mass hyaluronan is a more efficient shield than low molecular mass hyaluronan at similar concentrations. (A) High molecular mass hyaluronan meshworks overlap and aggregate with hyaluronan molecules attached to neighboring cell surface binding sites. (B) Low molecular mass meshworks contain hyaluronan molecules which are not long enough to overlap and reinforce neighboring hyaluronan aggregates, leaving spaces and channels through which particles can approach closely to the cell membrane. In our experimental model the particle was an enzyme, glucose oxidase, which generated damaging free-radicals including OH radical in a Fenton reaction. High molecular mass hyaluronan was an effective shield against the product of the enzyme, significantly diminishing cell damage, compared with low molecular mass hyaluronan (Ref. 6). I have described how the shape of hyaluronan molecules (their secondary structure) is determined by steric and H-bonding interactions between neighboring sugars in the chain (their primary structure). Their preferred shape in water features hydrophobic patches on alternating sides of the flat, tapelike secondary structure. The two sides are identical so that hyaluronan molecules are ambidextrous, enabling them to aggregate via specific interactions in water to form meshworks (tertiary structures), even at low concentrations. I have noted several consequences of this meshwork forming behavior in important biological contexts, for example in maintaining the transparency of the vitreous humor of the eye.